A few of us are getting together to do the OBC (On Board Computer) hack etc. on our boxsters this Saturday. Currently, we are only planning to do the button hack (not the four-stalk one). We may also do other work (rear speakers etc.) given time. 2 blocks from the GMC dealer on Stevens creek. 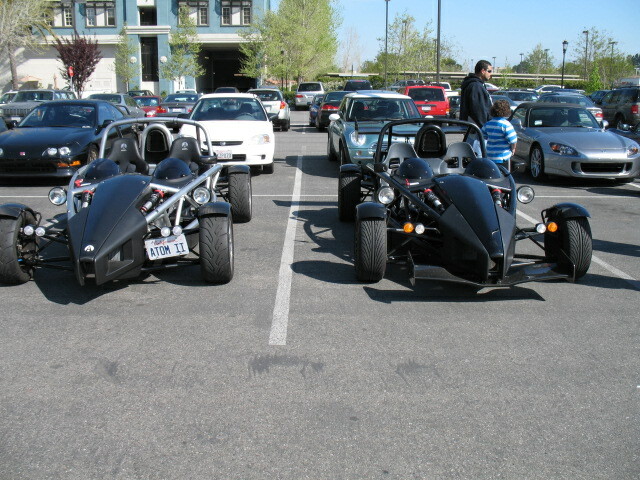 Stevens Creek Porsche is also only 2 blocks away. This is cas951's place, who is a new boxster owner (but a long-time porsche owner). He has Ramps, jacks, tools, aircompressor, power tools etc. If anyone wants to work on their car, or if you have done these hacks before and wish to share your knowledge, please join us. Please respond in this thread if you are interested. What's the " OBC hack"? 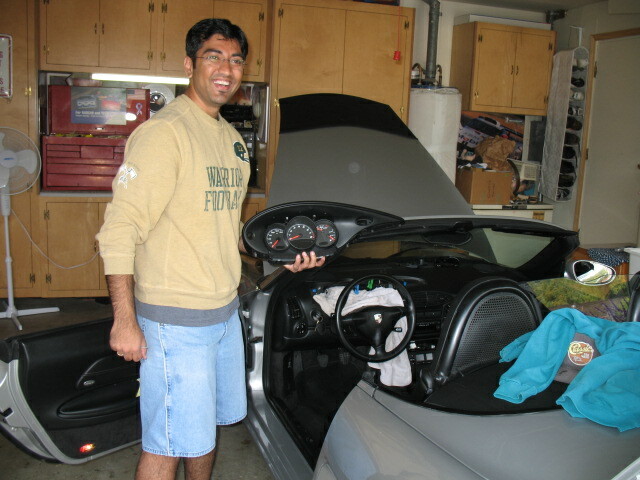 This is cas951's place, who is a new boxster owner (but a long-time porsche owner). If anyone wants to work on their car, or if you have done these hacks before and wish to share your knowledge, please join us. Please respond in this thread if you are interested. Sorry - edited my post now. OBC = On-board computer (shows temp., fuel mileage, avg. speed etc.). You can do both projects at the same time, to save time. That is the way we do it when a dozen cars show up and there is a time limit to finish because you are at someone's house. While someone is preparing the rear storage box for the speakers, someone is pulling the body trim pieces to run the wiring harness to the radio head (for 2002 and older). Raman has a dremel to cut the glue for the rear storage bins. For the OBC with switch, someone makes the wiring harness while someone pulls the cluster and switch trim. For a 2001 with switch you need one VW wire 000 979 009. These projects can be done in parallel. Although I doubt we will even have half a dozen cars show up, that is a good idea TP! 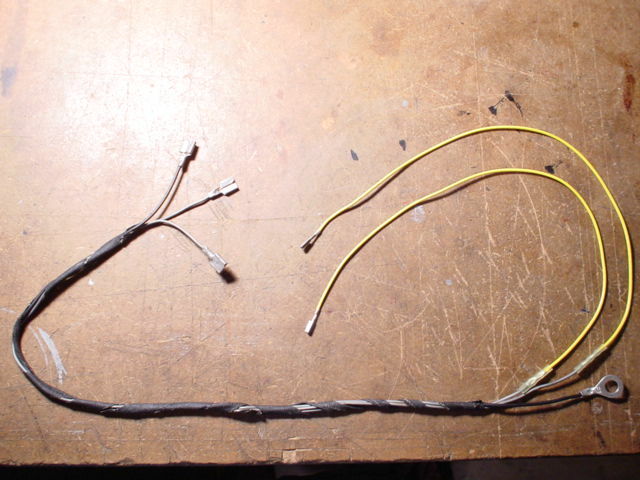 I made the wiring harness one evening when I had time, but there are a couple others who may need it done, so we will follow your suggestions. I also have some spares that I will bring that day (not the VW wire or the button, but everything else). General request: If someone that is planning to come has a dremel tool, can you please bring it? So, similar to the info I get from a Durametric device? Yoseif Whiteson was a local Boxster owner I knew 100 years ago. The use of VW wires was something that Peter Smith came up with. Peter gave me the instructions for the stalk retrofit and I gave them to Yoseif. 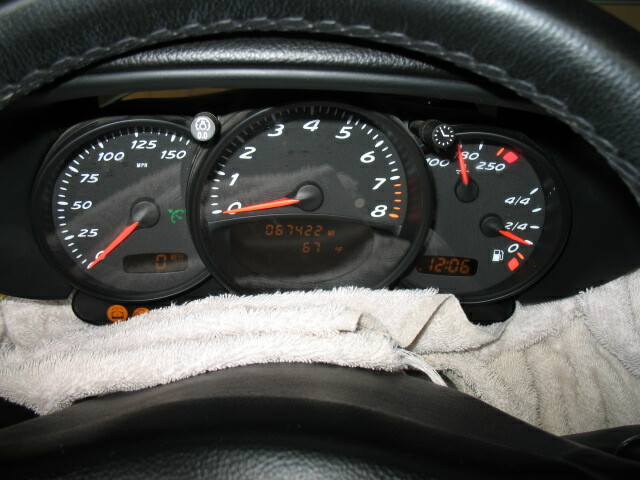 The instrument cluster changed in 2001. 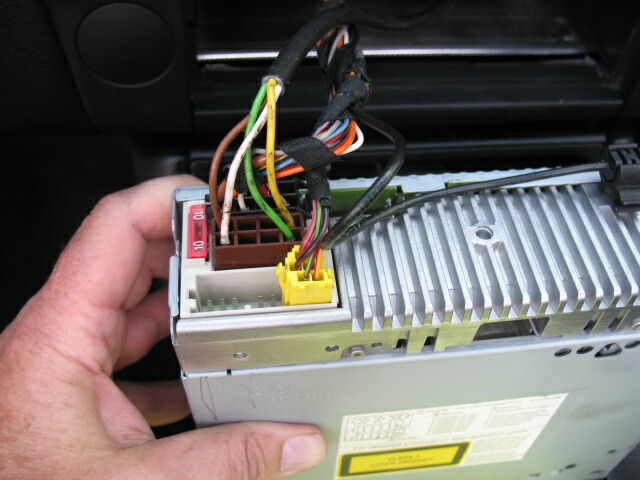 The 000 979 010 wire used for 1997-2000 did not fit as good as the 000 979 009 wire in the 2001 up instrument cluster connector. I then spoke to Peter and the instructions were amended for 2001 up. Yoseif did not get the amended instructions. In reality, either wire will work. The rear storage bins are held in place with a bead of glue. Sometimes you can peel the glue away with your fingers, utility knife, chainsaw, whatever will break the glue bond. On my 1997 with a retrofitted 1999 box I was able to peel the glue away with my fingers. On other cars the glue bead is solid and you need to cut it. Remove your box and take a look. If this is Saturday then you might stop by Santana Row in the morning. Yoseif Whiteson was a local Boxster owner I knew 100 years ago. The use of VW wires was something that Peter Smith came up with. Peter gave me the instructions and I gave them to Yoseif, then Yoseif put it on his site like he invented it. 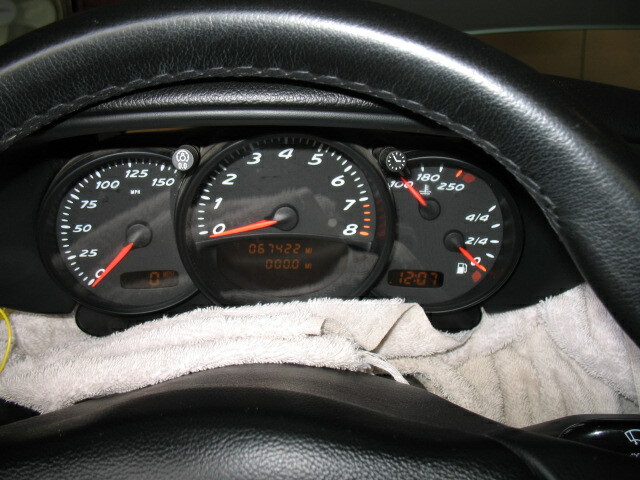 The instrument cluster changed in 2001. The 000 979 010 wire no longer fitted as good as the 000 979 009 wire in the 2001 up instrument cluster connector. I then spoke to Peter and the instructions were amended for 2001 up, but Yoseif did not know. I'd learned of most of the story reg. Whiteson (including the pic where Peter is working on Whiteson's car as he looks on) when researching the OBC hack in these forums. The story I have to share with you is a little related - will do that in person. Thanks for the tips with the storage bins - I'll take a look at it tomorrow. I'll be happy to take a look at your notebook. I'm guessing the OS is windows of some sort. Can I assume that you have tried running some form of antivirus program (which one)? Just trying to get a sense for the work involved, and what I might need to bring (if anything). See you Saturday. Btw, what was the Santana Row thing you'd referred to? The Santana Row thing started last year. I think it started as a Ferrari event but then all sorts of cars showed up. Lots of Porsches on the right day. I have gone to see the local owners I know, and for another reason. I have not tried to run any antivirus thing. It came with Norton for some days free, a few years ago. Henry and I went to Best Buy for that computer. I then bought the identical computer as a back-up. Ray said the first computer had a virus, so I started using the second computer. My secretary says I need a disc. I think I need an Atom. Thanks for letting me know - I'll stop by there on the way over to cas951's place, probably around 9ish. I'm PMing you my cell in case you are going to be there. I will be happy to look at your laptop if you bring it - if it needs extensive work, I may need to borrow it for the weekend. It sounds like you may be due for an upgrade - you can take advantage of my employee discount on IBM/Lenovo machines if you want. This offer stands for all renntech folks as well (discount only works in US though). Just PM me. Thanks to Efren for hosting this. 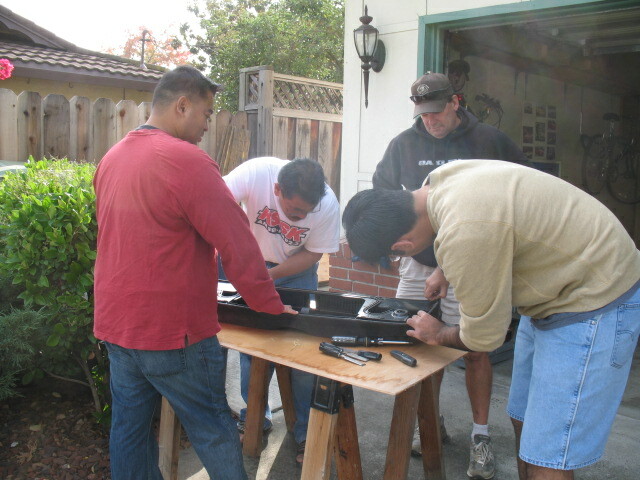 4 guys working on the storage/speaker box. 4 dremels were there, but no dremel was used or harmed. And they did it. Varun holds his instrument cluster like a fish he just caught. We tested the theory for a different OBC "hack" for 2001-2004. If you are only interested in seeing the outside temp display when the ignition is on and do not want to do the switch or stalk retrofit, then you run the 009 wire from slot 23 in the gray connector and ground the other end of the wire. When you turn off the ignition the display reverts to the normal trip odometer display. When you turn the ignition on you see the outside temp display. The ground end of the wire must be connected to ground when you see the temp display. If you are only interested in seeing the outside temp display when the ignition is on and do not want to do the switch or stalk retrofit, then you run a wire from slot 23 in the gray connector and ground the other end of the wire. When you turn off the ignition the display reverts to the normal trip odometer display. When you turn the ignition on you see the outside temp display. The ground end of the wire must be connected when you see the temp display. Are you also going to post the pic with the different colors on the connectors? That might help some of the renntech folks who try to use the older instructions with the red/green/black/black colored wires, instead of the green/brown/white/yellow colors that the new connectors have - I'm enumerating these colors here for when someone tries a search later on. There are 4 wires that go to the rear speakers. 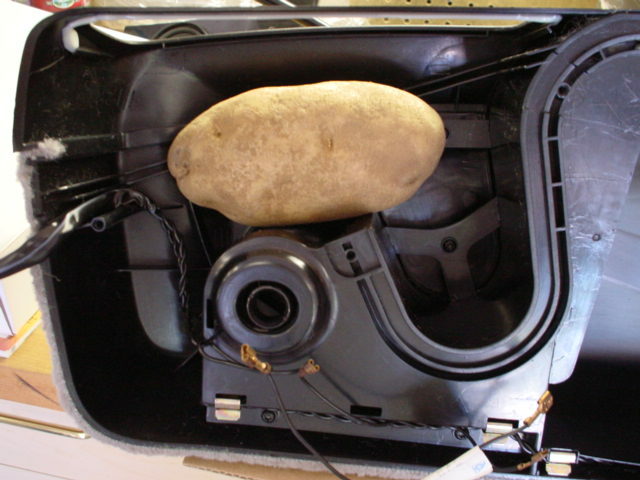 The pre and post 2003 instructions from Porsche reference them as green, red, and 2 black (ground) wires. 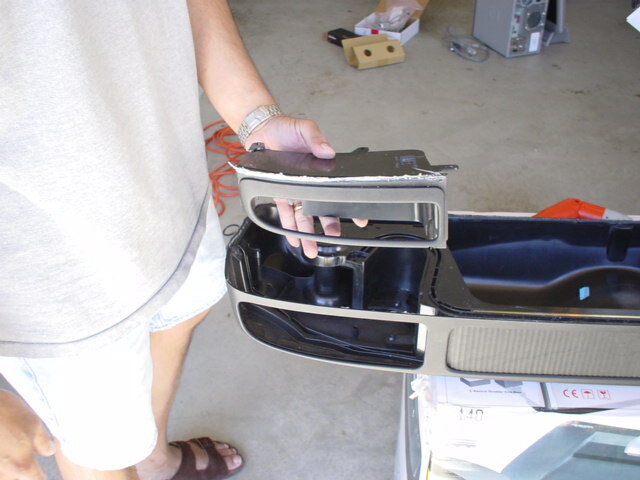 In the prior rear speaker installs we did those were the colors. With Varun's factory rear speaker kit, however, the wires were brown, yellow, white, and green. These wires go into the brown connector that is included in the kit.